Five well-spaced output levels with range between 3 to 3500 lumens easily accessed via a two-stage electronic switch? - Check! OLED display that can indicate: battery voltage/gauge, estimated runtime, internal temperature? - Check! Built-in active thermal management, charger and tripod mount? - Check! All this in a light not much bigger than a can of soda? - Check! 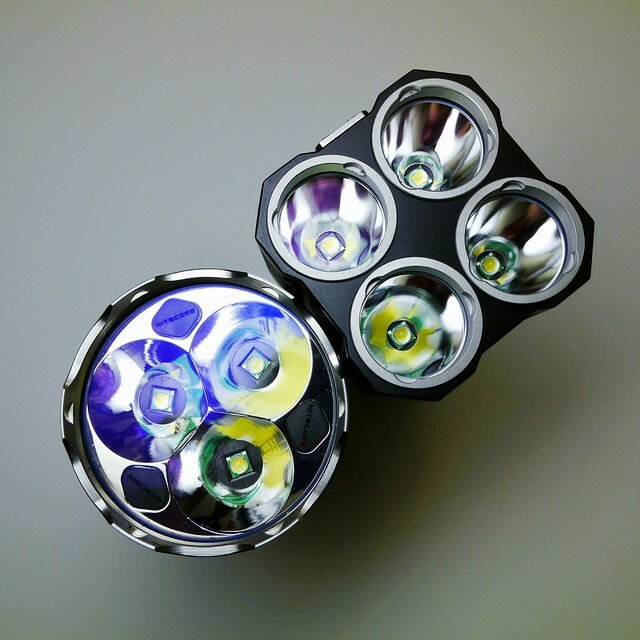 The above shots demonstrate just how compact the TM26 vs. other multi-emitter and multi-cell (w/exception of the SL3) lights. Please see this thread for commentary on this vid. 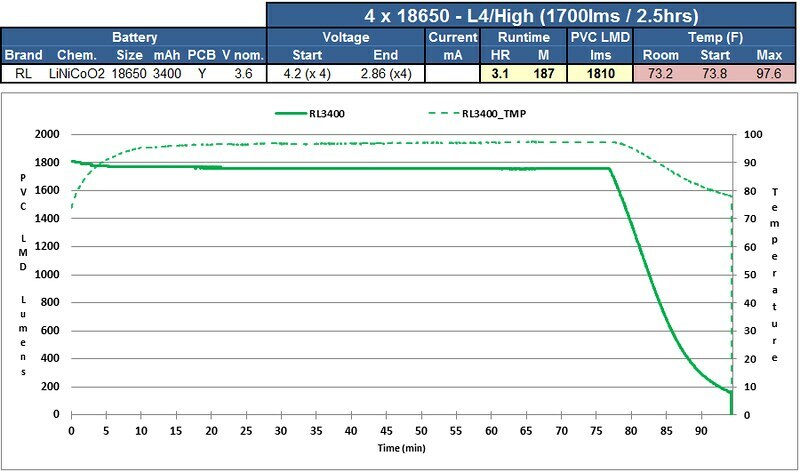 Max output measured @ 30 seconds was 3560lms w/4xRediLast 3400's (note: although I calibrate my PVC LMD before each runtime/lumens testing, the ambient temp will also cause deviations in readings). 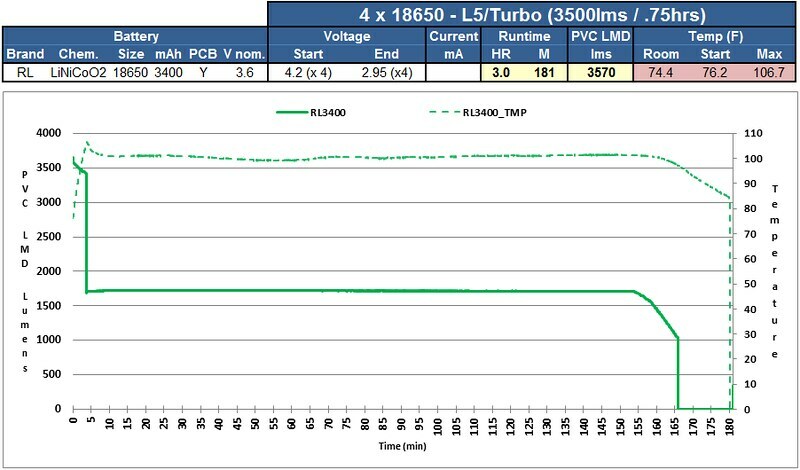 There is a general mild decline in output from the moment the TM26 is first turned until the thermal management kicked in at 3.75 minutes and the TM26 stepped down to L4. This is maintained in perfect regulation until the cells can no longer sustain output at which there starts a gradual decline. I didn't capture the tail-end of the run (the nose dive portion) since my logger cut out but total time to 10% of initial output was about three hours. awesome review as usual. but itll be more awesome if you had just one picture of comparison beamshots just so i know if this tm26 is worthy. Awesome review from TurboBB yet again, man the thing is small with such output. Looking forward for the beamshots ! Do you think the OLED display will suffer in time (exposed to such heat) ? Quick question though, how safe is it to charge the 4 cells in the light? Does it have a balancing feature? Thanks once again for another up and coming great review TurboBB. :bigsmile: It’s even smaller than I thought, and seems to look cooler in your pics. 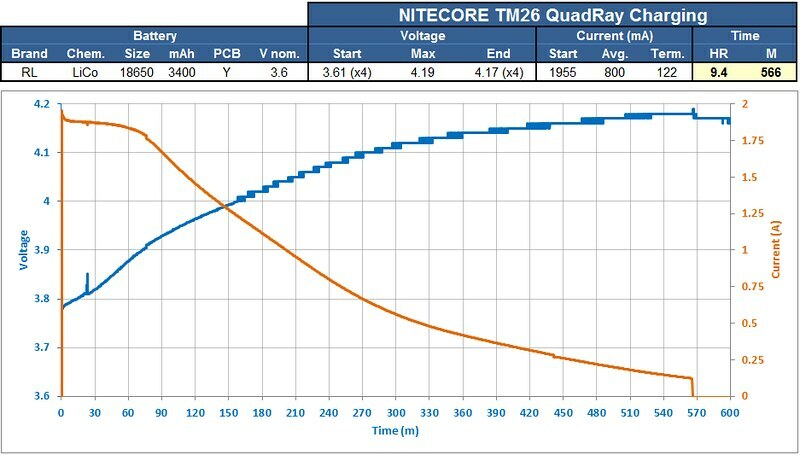 I’d be really interested if nitecore made a more compact version similar to the NiteEye 30 with 3 cells and 3 emitters, perhaps driven less with a “not so” aggressive thermal stepdown. 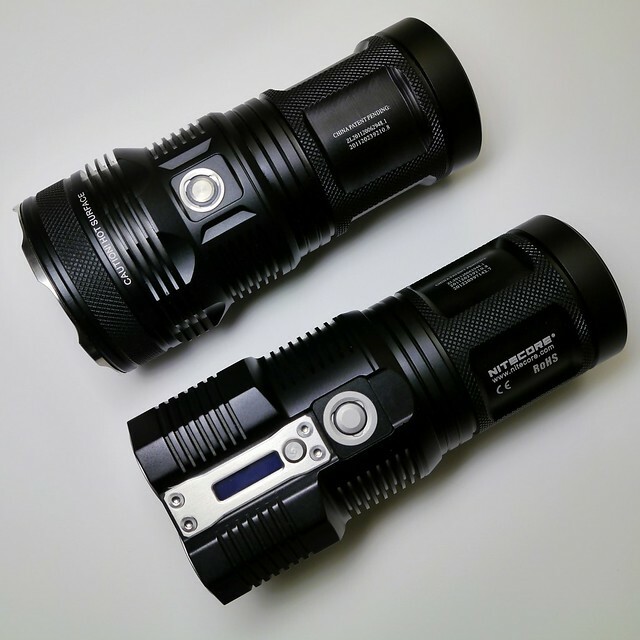 Still, this is one compact powerful monster with the latest nitecore advancements. a little expensive – but im sure they will release an xml2 at some point then i will be all over this one! I loved my TM11… nitecore has been making some great lights recently! arjay - again, provided you are reasonably familiar with LiIon usage & safety/handling and use protected cells (as extra precaution) it's safer than charging cells in series. The TM26 doesn't feature any active balance charging since all cells are connected in parallel with no separate nodes for discharge (to perform balancing). I'm in the midst of testing the charger and should have the vid up in a few days. UPDATE: Charging initiated at ~1.9A so if four cells then that's 475mA each. This will be a little high if just using one cell (of course depending on battery in use). Thanks very much for the review! Frontpage’d and Sticky’d. 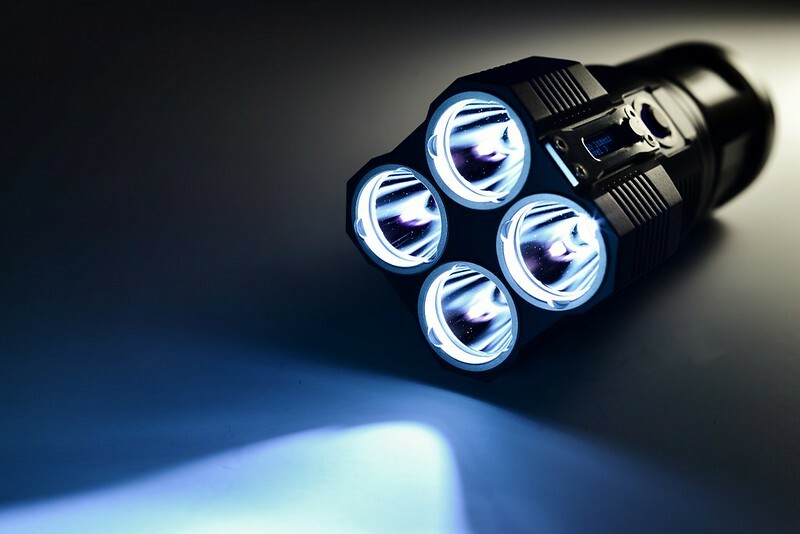 AuraBuy offer the brightest led flashlights at lowest price. If Only Nitecore would produce a diffuser cap, similar to the ones that Fenix puts out, for the TM 26! Given the wide variance of lumens, and the longevity, it is a perfect light for camping, and a small filter/diffuser cap would be wonderful. I have not found any items at home that would do the trick, due to its unusual shape. The Thrunite filter works perfectly with the TM15, as if it were made for it. If anyone has any ideas, please chime in! it is a wonderful light. Haven’t tried one yet, but the shape is not that odd; in-fact something square like a lid from a container I would think would work. Look around for a translucent container lid. 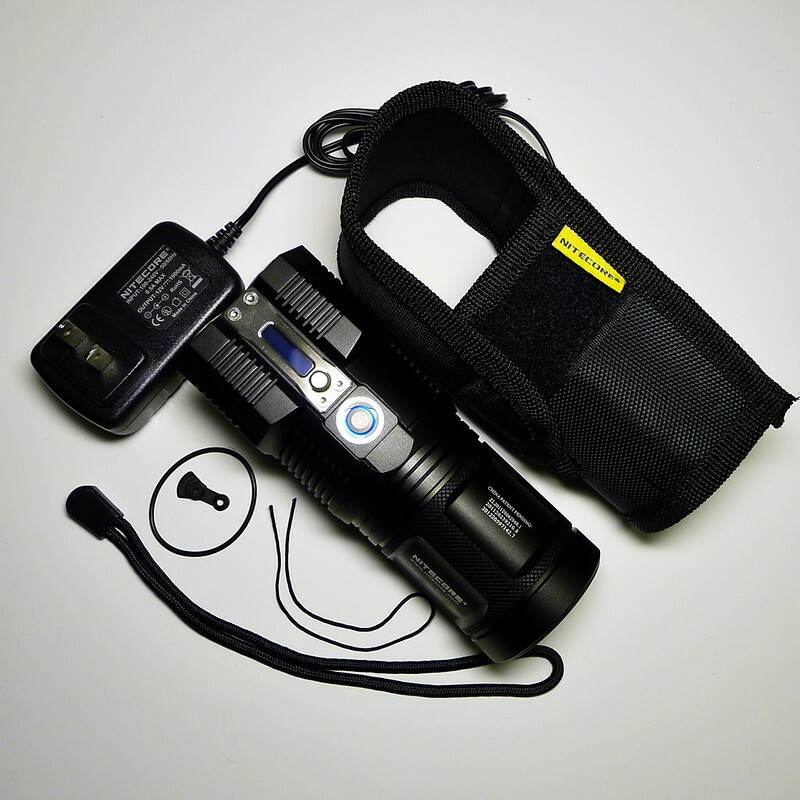 Fenix TK12, TK15, TK21-U2, TK61, TK75 Olight M20S, M21<span style="color: #0000ff;"
Thanks; I have. I would gladly pay someone who does this kind of work on lights for a good cap, diffuser, lantern. 1700 lumens is very powerful and even placing a plastic cup (we still call them ‘paper cups’) over it makes for a marvelous ambient light that can light a large room or a complete tent for campers. Fenix makes very nice ones, and I would love to see something that would also offer protection to the TM 26, as it is not cheap. (I say that now, with one eye on the new lower price and a tinge of regret for not waiting). I have read that people are even using the temperature gauge to measure room and outdoor temperatures and are finding it, on low light, very accurate. (I have to translate C to F in my head!). It has a wonderful, sturdy feel to it and feels so well made, it is worth having the nice accessory of a diffuser/filter, perhaps with a rubber protection trim in place. If anyone has any ideas, please post! arjay – again, provided you are reasonably familiar with LiIon usage & safety/handling and use protected cells (as extra precaution) it’s safer than charging cells in series. The TM26 doesn’t feature any active balance charging since all cells are connected in parallel with no separate nodes for discharge (to perform balancing). I’m in the midst of testing the charger and should have the vid up in a few days. UPDATE: Charging initiated at ~1.9A so if four cells then that’s 475mA each. This will be a little high if just using one cell (of course depending on battery in use). Thanks for doing the comparison measurements, it’s good to see them…..keep them coming I love reading these type of reviews considering I just bought a TM26 myself and was wondering how acurate the readings are, charge rate etc……Thanks! With the TM 26 specifically, what level do you reach that you recharge the batteries? 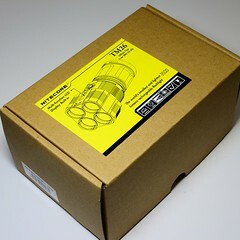 What is the nylon thread included in the accessories package used for? I just figured it out while typing. It’s used to thread the lanyard through the tail cap openings for the lanyard. Good review, thanks a lot, do you know if this batts fir in the light? I use both the 3400s and 3100s in mine BUT they scrunge (deform) bottom contact plate, so you can’t use 123s unless you pull the contacts up again. No biggie for me as I only use 123s for emergences but would not like to do that more than a few times. The flattop with a smidge of solder on top might help but I have not tried it. Flattop without solder won’t work. The performance of the cells is excellent in this light. The views in this post are mine, they are views and beliefs only, and not to be taken as facts. Man! I was so curious for days now to find out if the Fasttecs would work forced into the TM and got my answer just by stumbling across this thread! Thanks guys! Great review! That first photo is awesome. The perfect light for the nearly blind whitewall hunter. :bigsmile: I guess it turns to ashes if taken outdoors… HINT, HINT!! The perfect light for the nearly blind whitewall hunter. :bigsmile: I guess it turns to ashes if taken outdoors... HINT, HINT!! I know its a real pain trying to take descent meaningful outdoor beam shots. But now your reviews will be complete. Also, ignore my estimates, correct ones w/new map are in that thread. This video very good, thanks a lot. 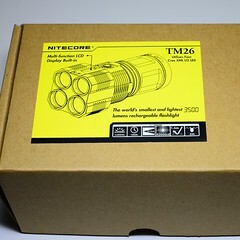 Hi everyone, i have the Nitecore TM26 and i have an important note to say. UNprotected battery is too SHORT in this flashlight, no contact with the drivers or they move. I don’t no if it’s just my flashlight or if it’s all flashlight??? With nitecore NL188 18650 protected all is good.